The most precious and important thing about Pebblespring Farm is that it has water. Water rises up in springs on the valley floor, just inside the fence line to the west. The water is always there, no matter how dry the season. Gavin Flanagan, over the road from us, says he have not seen the springs run dry since he has been visiting there as a child in the fifties. A small stream runs from where it wells up in the ground, first into a little marshy area overgrown with bulrushes (cattails to the American reader) and Poplar trees. Then into a dam that has probably been there since the seventies. When I first came to the farm it was all very over grown. It took me more than a month of weekends to even find the dam. I could see it on Google Earth. I have heard the dam spoken of by the old people, but the bush was so thick than I could not find the dam. I would try hack a straight line through the bush in the direction I reckoned the dam to be from the maps and aerial photos. But I would go off course and miss the dam to the east and come out on the pasture on the other side of the forest, or I would miss the dam to the east and find myself trudging through the marsh and the bull rushes before coming again to the pasture. I began to think the dam had washed away completely in a big flood and that my aerial photograph was just out of date. Eventually though, we found the dam. Cutting through the bush we came to a depression and a bank with a bed or bulrushes in from of us. It looked like it could be the dam we had been looking for, but had to scale a tree on the edge to be able to see over the tall bulrushes to the small patch of open water in the centre of what remained of the dam. Slowly we cleared a path along the dam wall. We were working then with hand saws and garden pruners. I had not yet bought the chainsaw. The going was slow, especially in those places that were thick with brambles that would rip through the skin on forearms and legs. Jeans were ripped to threads at the thigh. I would come home bleeding and exhausted I the evenings. This idea of stewardship informs my approach not only to the stream and the dam, but to the forest and the marsh, the pasture and the brush. My approach is to observe. To see where I can help. To see what intervention I must make to assist the land to achieve the fullness of its potential. The role of steward is an important part of the land and of the farm. It is a role that I treasure, but it is a role that is different on Pebblespring Farm to what it would have been on the next door farm or on a farm 100km way or 1000km away. It is a role that is different in every different place because on the significant portion of time that is spent, and must be spent in observation. I spend time observing the pasture, what plants come up at what times of the year? I spend time up on the hill, observing how the water is washing the topsoil in the big rains. I spend time observing the dam, noticing how the water level rises for two or three days after a downpour. I notice how the Tilapia become active on the surface when the water is warm. I observe how the duckweed on the dame looks different when it regrows after the Tilapia have eaten it. I observe how the green algae from the floor of the dam rises to the top after the Tilapia feed at the bottom. I could not have approached the farm from a distance and with predetermined idea of what to do there. I could not have sent in the bulldozers, flattened everything to achieve what I may have put on paper as a vision for the site. This though is the conventional approach. It is an approach that is forced on us by people with accountant and lawyer minds. It is an approach that separated design from implementation for practical “cost control” reasons. This is the approach that government takes when it takes on developments. This is the approach that corportate sector takes when it takes on development, but it is not the kind of approach that makes sense if we are looking for the most effective response to the challenge. Because it is while I am working that I am observing, and out of observing comes design, and from design comes work. These things flow seamlessly into each other and form each other. So, start today. Take time to observe the taste of the morning coffee. Notice how the dog feels when you stroke it when it comes to greet you. Take note of how the bacon smells as it fries in the pan. These are small steps, but trust their significance. Even when the bad stuff happens and some idiot cuts in front of you in the traffic, or spills Coca-Cola on your new white T-shirt. Observe your anger. Notice how it feels in your chest, notice how it migrates to your stomach after a few minutes. Feel the heat as it rises in your face. Just observe it. Take notice of it. Don’t try to stop any of this. Don’t intervene; just get into the habit of observing. The time for action will come and at that time your action will be informed by a deeper level of awareness. Your actions will be reflective of a consciousness that informs them. Cows are beautiful to watch in the pasture as they munch away at the grasses that they seem never to get bored of. We only have two cows are Pebbeslpring farm. The land is big enough to take between 10 and 20 cattle, but right now the pasture is small with so much of the ground having been overtaken by the terrible invasive Port Jackson Willow (Acacia Saligna) and the even more nasty Inkberry (Cestrum laevigatum). The Inkberry likes the lower lying wetter areas and is poisonous to livestock. The cattle find the Port Jackson quite palatable. I will see them fighting each other to get to the Port Jackson if I have just let them into new pasture. 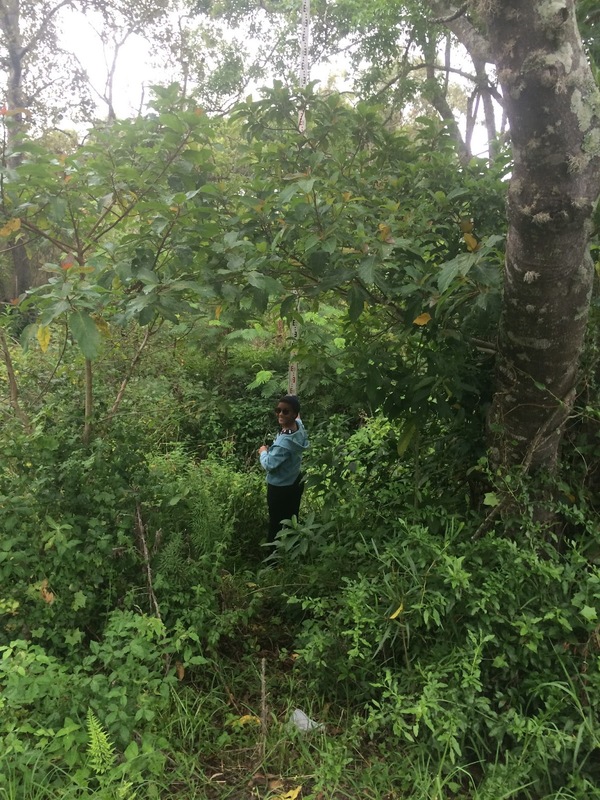 The problems with the Port Jackson, is it grows so dense that the cattle find it difficult to penetrate and the leaves grow high and out of reach because the density caused it to be too dark for leaves near the forest floor. Also, because the Port Jackson are so densely packed, grasses can grow on the forest floor, again not good for the cattle because they like grass much more than leaves. 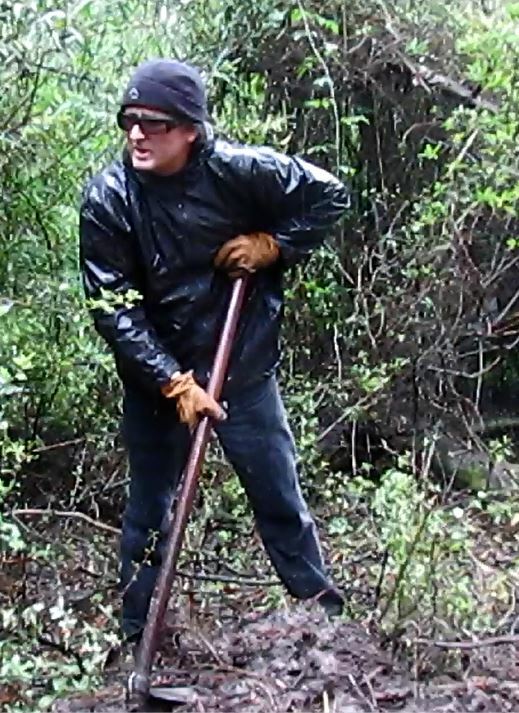 But also with no grass or any other growth on the forest floor under the Port Jackson, the soil on the steeper slopes begins to wash away in times of heavy rain. So our attitude toward the inkberry has been to remove it wherever we find it. We cut it down as close to ground level as we can. When it sprouts again we cut it again. Eventually it stops growing. The Port Jackson, however, I have been more selective with. I have begun rather to cut them in such a way so as to leave behind a savannah of sorts. Trees spaced in a pasture in such a way as to allow enough light to get to the soil and allow the grasses to grow. I have noticed that, at least in the summer months, the grasses seem to be taller and greener in that part of the pasture near the edges where the trees are. I guess it has to do with the fact that there is a little less evaporation there because of the shade. Perhaps there is extra nitrogen there because the cattle lounge there to keep out of the heat, perhaps because the Port Jackson willow is nitrogen fixing, the grasses are able to absorb this critical nutrient near the tree and grow greener. I don’t really know why the grass grows taller and greener where the trees touch the pasture, but I know that it does and my attempt is to mimic this pattern to see if I can replicate the results. Of course all of this stuff about pasture is quite possibly more interesting to me than it is to you. Books have been written about pasture. Entire library shelves filled. 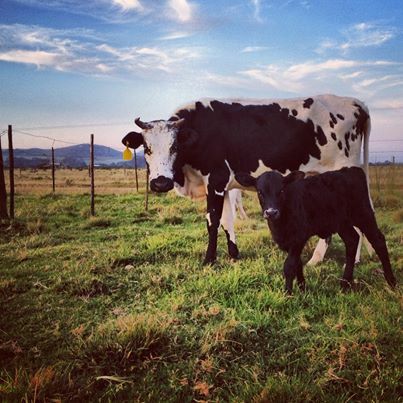 The important thing to take from the pasture is the undeniable fact that we are dealing with a living system. In a very real and observable way the cattle and the grass and the soil are part of the same organism. The grass has evolved to look, taste and behave the way it has because of grazing animals like cattle. Cattle have developed their size, shape and biology because they have evolved in the pasture eating the grasses that they do. In the same way that the predators shape the herbivores and the herbivores shape the predators. But these are not just curious facts of anatomy and biology. These are fundamental truths, absolute laws that whether we choose to or not are a governing force in all of our lives. It may appear that I, as an individual, am a separate organism to the people around me and to the things that I consume and to the things that try to consume me, but in truth, with the perspective of evolution and of time, I am not. Of course the illusion of separateness of those on board the Apollo missions is evident to any 10 year old who will point out the earthly origins of the craft’s food, water and oxygen, but somehow, the irrational illusion of “separateness” endures. So when I sit in the pasture. When I observe the earthworm, when I appreciate the cattle, I let the picture remind me of who I am. I let the picture remind me that I am a part of an organism, an organism that is beginning to show signs of disease caused largely by people, very much like me, that they have somehow come to forget the obvious truth that they are a small (and very important) part of a big organism. Perhaps the disease afflicting the planet is like the disease of cancer that afflicts so many of our bodies. A disease that killed my own father. The doctors say that a cancer cell is a cell that has forgotten that it is part of body, part of an organism. A cancer cell consumes energy and replicates, but it has forgotten its function in the organism it grows and grows until it kills the body that it forgot that it was integrally part of. The cancer cells form tumours that are fuelled by excess sugar. In the same way perhaps these bodies, these people, form cities distorted beyond any useful shape and size by the injection of excess fossil fuels. I have been struggling to get our chickens into proper accommodation. I moved them to the farm a couple of months ago already now as part of a massive back yard clean-up campaign in the build-up to the big party we had at home toward the end of last year. The chickens were hurriedly put into a two metre by two metre box. Well it’s not really a box, more like a frame, a box without a top or a bottom. It was built hurriedly in July last year as a temporary structure to hold the newly born puppies that were running amok and getting themselves drowned in the pool. I am generally reluctant to throw good stuff away and thought it was very creative of me to re purpose the puppy box into a chicken box. 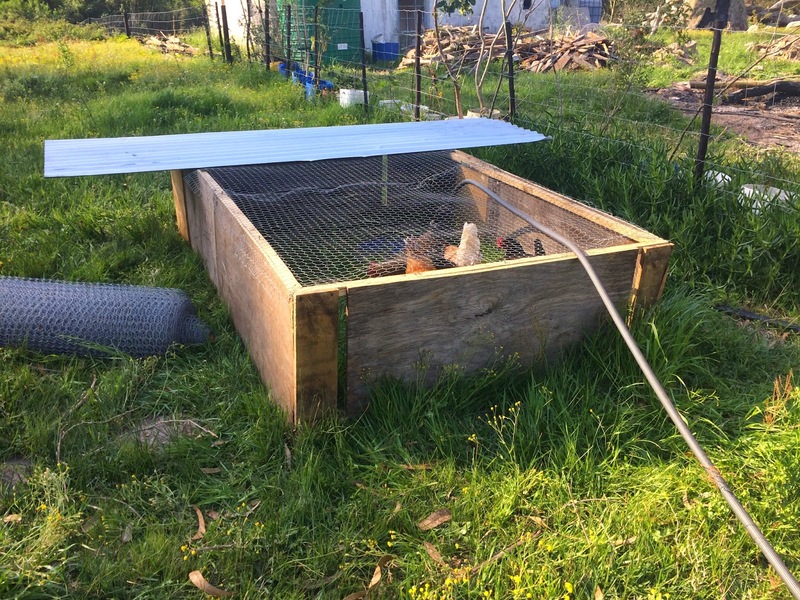 I moved it to the farm, put a bit of chicken wire over the top nailed a little egg box in one corner and we were in business, we had a portable structure that we could use to pasture our hens. Moving them to fresh grass everyday where they can scratch and dig and set there manure down in such a way that it is a huge benefit and not a toxic problem requiring hours of our precious time to clean, cart and sanitise. And after all, we had tried pasturing poultry this before with broilers in the suburbs so I was pretty pleased with myself for the quick thinking re[purposing project. Taking a pile of old wood that was surely headed for the tip and turning it into an egg producing, pasture fertilising machine. Absolutely brilliant! The mongoose, or whatever it was that found the pastured poultry pen on night number three, had other ideas. On the morning of day four we found a hen dead and with a hole ripped in its stomach and its intestines ripped out. On the morning of day five we found another hen, this time with its head gone and a similar problem of missing intestines. The best that I could figure is the chicken thief was squeezing under the frame in the small gaps between the timber and the grass. It was killing and eating inside there and then getting out the way it came in after it had had its fill. I was deflated. You and the family were kind. You only went on with “why didn’t you just…” and “wouldn’t it be better if?…” for about a week. I was let off lightly. But we did find a solution, after reading the farming a permaculture websites and forums, I came across and American farmer, Joel Salatin’s suggestion that foxes on his farm are discouraged by a metre wide “apron” of chicken wire around the pen. Apparently the fox is not bright enough to know not to start digging a metre before the pen to dig under the apron. I tried it out and yes it works (on what I still only suspect is a mongoose problem.) The chickens have survived every night since then, but still no eggs. I am not sure what the problem is, perhaps they are being harassed so much every night that they are too stressed to lay? Perhaps the ratio of roosters to hens is now wrong (since the mongoose took hens and not roosters? I don’t really know. But there are no eggs. Now to make matters worse we have puppies in the house again. Our beautiful mommy dog, a gracious, gave birth to 11 lovely puppies, five weeks ago. This week one little puppy accidently got out of the secure area and stumbled into the swimming pool and drowned. Everyone was in tears. We had a crisis. I have been having a busy time in the office so the best solution we could come up with is to hire a trailer, go fetch the puppy box, which has now become hen box and turn it back into a puppy home. This is what we did. The problem of course is that the chickens are now in very temporary accommodation and I am hoping will all survive the sly mongoose until tomorrow, Saturday, when I can spend the morning making more permanent accommodation for these incredible animals. In a roundabout way, what I am saying is the seemingly simple task of getting eggs from the chickens actually takes a lot of care, effort and management. Those that do it well make it look very easy. I soon will become one of those that make it look easy. But right now, even though my hens are not laying, I am still eating omelettes. Through some fortune, I am able to sell some other goods and services in order to get money to buy eggs. There is nothing wrong with this system of trade. In fact it is a very clever mechanism; it can though cause us to begin to create in our minds a distorted view of reality; a view that dislocates the desire to eat omelettes from the desire to learn how to care for hens. Our system can create an illusion in our minds that in some way those that live around us, in the same city or the same country owe us omelettes, or owe us a living. That we are somehow entitled to be given stuff. Giving is a very good thing to do. In fact I make the effort to give as often as I can, especially to people I can see really need help. But when I give, part of my duty to the person receiving is not to allow his mind to be poisoned with some irrational belief that he should expect me to keep giving to him. If I fail in my duty, he may come to forget that it is a fundamental law of how things work that you have to put in the effort, physically, mentally and spiritually. He may come to forget Law of the farm number 2: If your hens don’t lay, you can’t eat omelettes. I may even have left him worse off that when I found him if I don’t take the effort to help him see this. So in my life I try to remind myself, as often as I can to stay real in that way. I try to stay observant. If things are coming too easy, yes I celebrate, but no I don’t take it for granted. I don’t expect it will stay good forever, because I know time will correct the situation because of the fundamental laws that are in place. If I have not made the effort then I should not expect any reward. If something has come my way out of luck I count it as a windfall, a lucky break and I make every effort not to allow my mind to expect it to happen again. This is the law of the farm! Law of the farm Number 1: “One plus one equals three"
In the last few months I have been planting fruit trees and nut trees on the farm. In between them I have been planting berries. I have taken quite a bit of effort to prepare the land using a system of swales constructed on contour that will help to retain moisture and soil nutrient. As these swales weave their way through pasture and bush, I have cleared to unwanted invasive species and have used their timber in the base of the swale mound to form the basis for composting that will take place over time. It’s a very old system of planting and I have done what I can to read as much as I can about it. But regardless of the preparation I have done for my apples, mulberries, figs and lemons, it comes down to digging and hole and planting a tree. (One hole plus one tree). Every one of us knows since we were two years old that one hole plus one apple tree does not give a hole and a tree, rather it gives and abundance of apples, shade, blossoms, wood and pleasure for a hundred years. In the case of the apple tree one plus one does not equal two. It equals two million perhaps. I suppose one hole and one apple tree does only equal a hole and a tree in some laboratory somewhere, which will control the environment in such a way as to ensure that there is no sunlight causing photosynthesis, that there is no water in the soil to feed the roots, that there are no organisms to transform the organic material into beneficial nutrients. Then I am sure the tree will not grow, proving that one plus one does equal two. But thankfully we do not live in that laboratory. Where we live and where I plant my trees on the farm one plus one does definitely not add up to two. But where we work and where we play out our middle class lives, those that try to sell us stuff or buy our time present “one plus one is two” as a fundamental law of the universe. One month’s work equals one month’s wage, because “money does not grow on trees” One hamburger can be bought for the cash price required of one Hamburger, because “you get nothing for nothing”. · One lifetime dedicated to one corporation equals one pension funded retirement. Now, let me look at my own life. What can I do with my new understanding of the law “One plus one equals three?” Not everyone has a farm on which plant apple trees of course, but what can we do that will show massive dividends later? What can I do today that has a lasting impact that does not require me to labour over it day and night? What lasting things can I do today, that keep on paying dividends? What if I did one thing a week that would have lasting impact? So much of what we do is wasted. If I wash my car today, I have to wash it again tomorrow. If I watch TV tonight, I have nothing to show for it in the morning. But if I tile my bathroom, or arrange photos in my photo album, or paint a picture, or write a poem, these things are lasting and keep on giving much more than once. This is where our focus must be. Where we must do things or buy things that are temporary, let’s set a rule. Let’s not buy anything that will not last five years. Be it shoes, or a jacket or a cap or a skateboard. Let these items keep paying dividends for years. Let’s make a rule to cut down on those things we spend time and money on that don’t deliver dividends. I am not saying you should not from time to time splash out and have a great steak at a restaurant, but to invest time and money in drinking a R200.00 bottle of wine every night is to become addicted to a passing pleasure that could rather have been a lasting gift. The Fashion industry is capitalisms mechanism for making us all believe that we must keep on paying. Fashion tries to get us as close to the ideal of “use it once” as they can. I know women that will not be seen in public wearing and outfit that they have already been seen in. (I am sure that there are men who behave in this way, it’s just that I have not yet met them) The fashion mind-set began with clothing, but there are clever “marketing gurus” that have managed to shift the focus into music, automobiles and electronic devices. I am not suggesting that the new car is not better than the old one. I am saying that we are motivated to buy the new gadget only partly because it is better and largely because it is more fashionable to do so. What I am saying is that the iphone 3 is a fantastic piece of technology. There are very few practical reasons why we could not allow the gift to keep on giving, but we don’t allow it to do so, we buy the iphone 4, then the I phone 5, then the iphone 6. We do this because we are not open to the idea of investing once and then allowing ourselves to receive multiples of one. We are not open to the idea that one plus one can be equal to more than two. In relationships we are the same. We limit ourselves. We do not invest in a handshake, or a smile or a bit of meaningless banter with a stranger, because “it’s not worth the effort” We expect in return at best only a smile, or a handshake or a bit of meaningless banter. (at worst we fear that we won’t even have the smile returned, and we will be left in deficit) If though, in our minds we can begin to expect, even demand, that a smile will be returned as a smile and perhaps a warming chat, or an exchange of useful information, or a hug, or a kiss, or a lifelong relationship including seven children and big house in Plettenberg bay, then we will begin to receive those in return. We must though, begin with the expectation that it is absolutely normal and natural to receive a lot more than we give. That is the way of the living universe. That is the Law of the Farm. 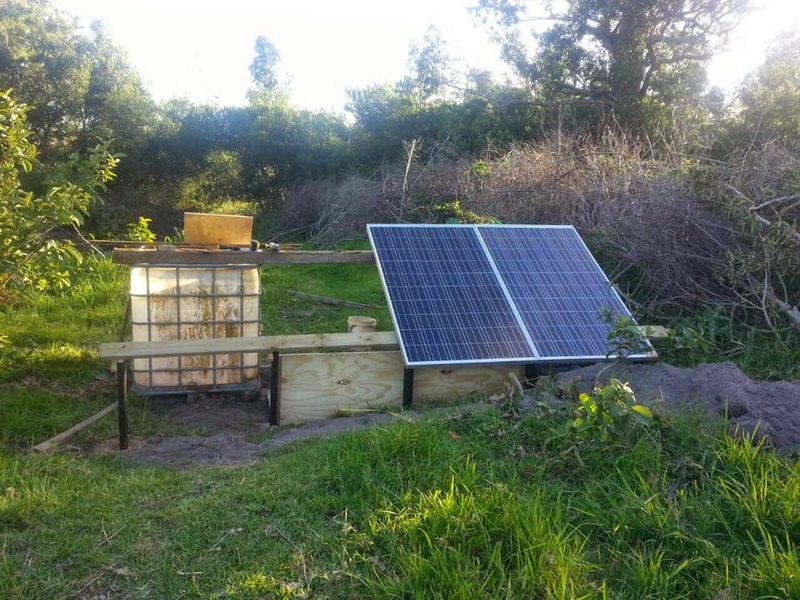 Author Tim Hewitt-ColemanPosted on 2015-06-07 2018-04-02 Categories All Posts, Freedom & Farming at PebblespringLeave a comment on Law of the farm Number 1: “One plus one equals three"
Load shedding makes us all angry. We are frustrated with Eskom. We are disillusioned with the slow progress with the building of new power stations. We are suspicious of dodgy deals with the Russians to build nuclear reactors. Many of us are investing emotion and passion in this negativity, but my family and I are rather investing my energy in doing what we can to move away from the gird in whatever small steps we can. I am speaking about this because I see that much of the discussion about “off grid living” generally comes from one of two extreme positions. Firstly there’s the guy that is living in his 1974 Volkswagen camper, who powers his whole existence from a wind turbine he built by re-wiring an old desk fan he found by the roadside. He doesn’t need to cook; because he eats all his food raw and he avoids hot water because “everybody knows” that washing is part of a grand Illuminati conspiracy. The second extreme position is that of the billionaire in Houghton who builds a state of the art solar panel system bigger than my house. It tracks the movements of the sun by means of clever engineering and software developed by the SKA project. The power is stored in batteries just like the ones on the Mars rover. The whole system does cost about the same as a cabinet minister’s annual salary, but comfortably runs his air conditioning, 90 inch TV’s, heated pools and a mini ice rink. Caught between these two extremes, most of us simply give up and rather focus on wording clever status updates that ridicule Eskom executives. But I am here to tell you that there is hope. There is real and immediate action that you and I can take toward moving off grid. You see, I have just recently installed an off grid power and water system at our little farm just outside Port Elizabeth, and you know what? It didn’t cost me an arm and a leg. In fact it cost me round about the same as what it would have cost me to get water and electricity brought to the farm by the municipality. Hear what I am saying! The cost of installing a system that will generate free solar electricity and clean running water in perpetuity is the same as what the grid would have charged me just for the privilege of being connected to them and being billed by them with ever increasing rates regardless of the reliability of their supply. Of course there will be some on-going costs, but there won’t be load shedding, there won’t be the mindless standing in queues at the “customer care” centre, there won’t be the lying awake at night with the guilt of knowing that I am pumping huge amounts of carbon into the atmosphere every time I switch on the lights. You may not think that my situation on the farm is relevant to everyone reading this, but what I want to tell you, is that solar panels and rainwater tanks are only part of the story. There are two important aspects to consider. Firstly, we must re-think what it is that we have become dependent on the grid for, remembering of course that the idea of a “gird” dealing with our electricity, water supply, sewerage disposal, telephone and internet is all reasonably recent. There is no reason we can’t step away gradually from the grid, in the same way as we slipped slowly into the habit of becoming dependent on it. Do we need to use so much? Do we need the air-conditioning? Do we need the heater? Do we need the ninety Inch TV? Do we need the welder in the garage or the toaster in the kitchen? Do we need to plant our garden full of plants that have beautiful flowers but that will die without the quantities of water they evolved to become accustomed to in the swamps of the Amazon? There are thousands of actions we can take today to consume less energy and water and to produce less waste. Secondly, after we have taken the obvious step of consuming less, we must do what we can to diversify our consumption and waste. What I am saying is, it may cost the same to cook on gas, but it is unlikely that the gas supply will run out at the same time as the electricity supply grid. What about rain water? You may not have enough storage to make you independent of the municipal system, but you may have enough to be able to use the municipal system as a backup and not a primary supply. Even just to irrigate your garden would be a step in the right direction. Cooking and heating with firewood is not a bad idea, in fact it’s fun and romantic. What about processing some of your waste in a compost heap, grey water system or septic tank? What about heating your house with sunlight and cooling it with wind? What I am talking about is migrating off grid in small steps. First by consuming less, then by transitioning into a hybrid situation, where each time the grid goes down it is less and less of a disaster to you and your family. There are things we can do. We are not helpless and doing these things makes us feel a lot better than when we are bitching about Eskom. Don’t you think?